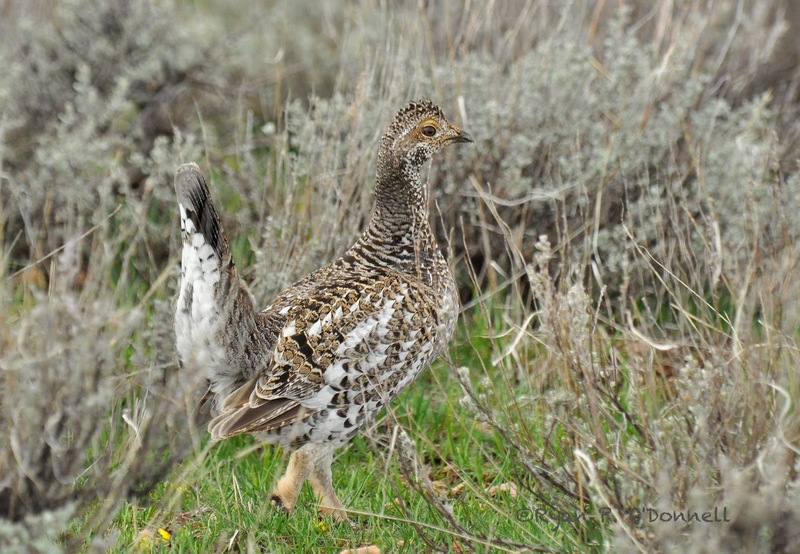 A Dusky Grouse x Sharp-tailed Grouse hybrid, photographed by the author in northern Utah on 7 Apr 2013. I love hybrids. Some birders can be disappointed by hybrids, especially when a locally rare species turns out to not be "pure" (and thus can't go on a list). But for me, they have everything you could look for in a bird: They are generally very rare: even the more common hybrids are rarer than their parent species. They are often a challenge to identify. And they give us a peak into the process of evolution: why don't we see more hybrids, and if two species can produce hybrids, why are they considered species? I was hiking around a local birding spot (Hardware Ranch W.M.A.) a couple weeks ago, and I saw what I thought at first was a Sharp-tailed Grouse. 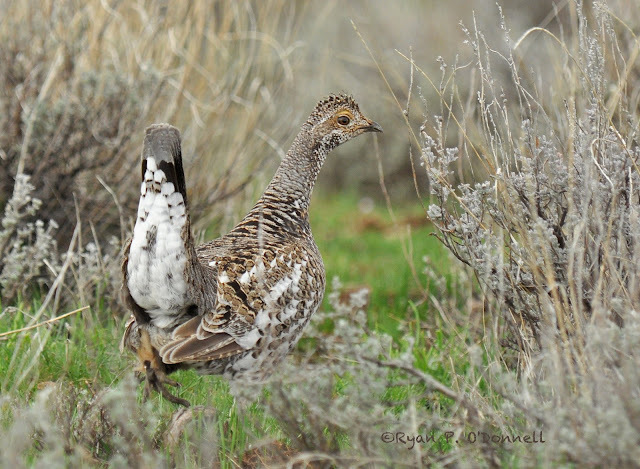 This bird was running through the sagebrush, with its tail held high, showing bright white undertail coverts, like Sharp-tailed Grouse do. It had a slightly crested head, and an overall yellowish tone, also fitting Sharp-tailed Grouse. But when I got my binoculars on it, I could see the black tail feathers with broad charcoal tips, a clear mark of a Dusky Grouse. I was able to grab a couple photos before the bird flushed, and flew off through the sagebrush. Later, I became suspicious that I had photographed a hybrid. Hybridization between these species had been documented once before, by Allan Brooks in 1907 (illustration below). I sent the photos around to a few grouse experts I knew, and a few people who knew grouse experts, and all the replies came back that this was indeed a hybrid Dusky Grouse x Sharp-tailed Grouse. Interestingly, although I haven't been able to find any other photographs of this hybrid, one biologist indicated that this is the most frequently observed hybrid combination between wild grouse. Local biologists have told me that they have seen a male Dusky Grouse displaying among a lek of Sharp-tailed Grouse about 25 miles (40 km) north of where I photographed this bird. That same male Dusky, in fact, even tried to mate with a Sharp-tailed Grouse while the biologists had it caught in a trap! 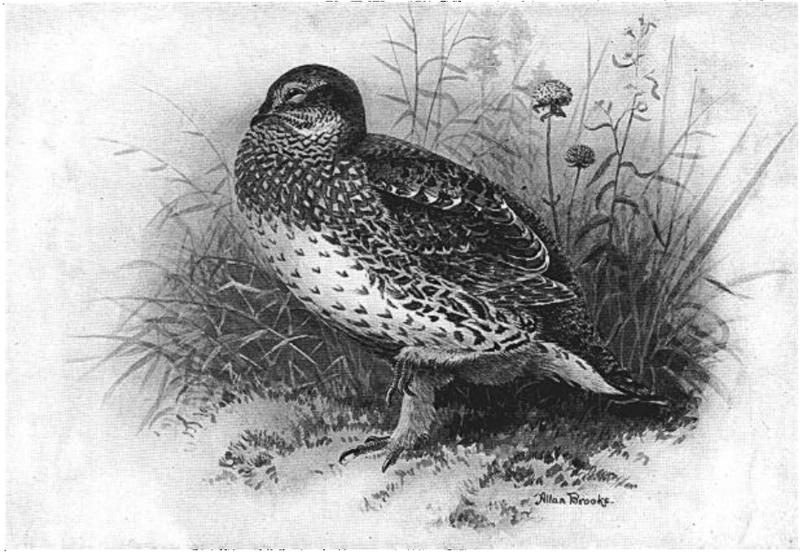 A Dusky Grouse x Sharp-tailed Grouse hybrid, illustrated by Allan Brooks and published in the Auk in 1907. The same Dusky Grouse x Sharp-tailed Grouse hybrid shown above. This is the second of the only two photos I was able to take before the grouse flushed. Wow Ryan, lucky you! Well written post. I love seeing illustrations and records from the early 1900's. Anyway, great find.